Early the following morning, a group of children were escaping from Austria – traveling by train to London. Uri’s parents had secured him a permit to join them. They gave him the address of a distant relative in London, confident that that he would care for their son. Before leaving the house the following morning, Uri’s father asked him to solemnly kiss the mezuzah on the front door of their home. “May the angels that protect our home with this mezuzah shelter you on the journey of life,” he tearfully declared. Deep down, Uri knew that he would never see his parents again. In London, Uri was taken by car to the address of the relative and left alone outside the house. He looked around. Everything was so strange and unfamiliar. There was no mezuzah on the door. “Is this where his relative lived? Perhaps in England people do not put mezuzot on their front doors” he thought. After repeated knocking, an elderly fierce-looking man opened the door holding his dog. He took one look at Uri and yelled, “No Jews here” and slammed the door. Uri swallowed his tears and began to walk the streets. Nobody gave a second look to the forlorn boy wandering along, holding a small suitcase that contained all his worldly belongings. He was so tired and hungry. “If only I could find a house with a mezuzah,” he thought. A couple of hours later, he turned into a street and there on the doorpost of the first house was affixed a large mezuzah. With a joyful shout he rushed up the path and knocked frantically on the door. It opened immediately and there in front of him stood a bearded elderly man who reminded him so much of his father. Uri was too exhausted to talk but when he recovered, the family reassured him that he would live with them and they would care for him as their own child. Uri never found his relative but he saw that G-d fulfilled his father’s prayer – the angels of the mezuzah had indeed protected him. 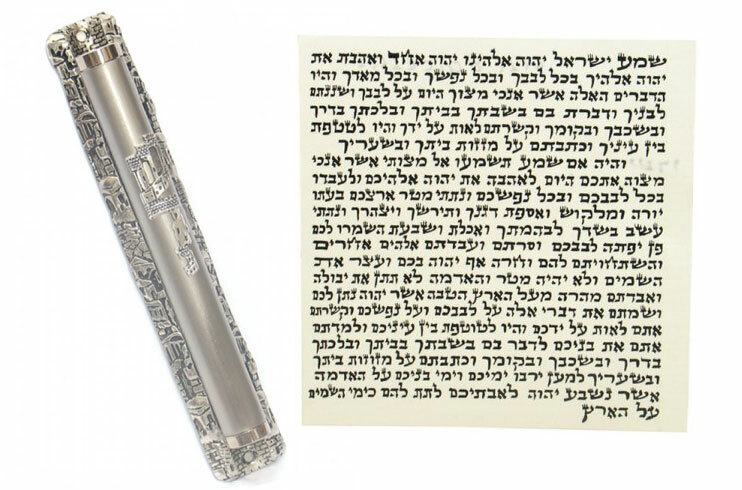 As a reminder of that morning so many years ago, he presents a beautiful ornate mezuzah to each of his children and grandchildren on their eighteenth birthday and although already an old man, every year, on his birthday, he gathers his family and tells them again the story of how a mezuzah saved his life!